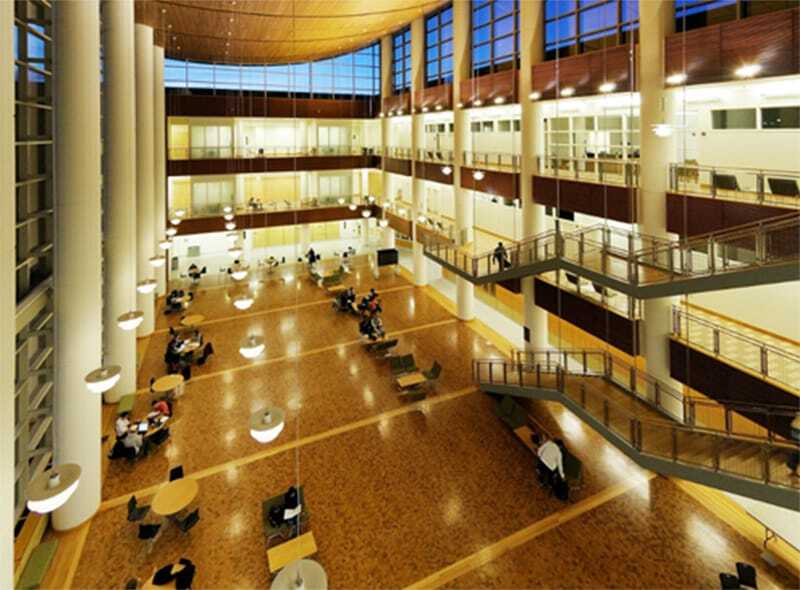 The University of Illinois Urbana-Champaign campus’ Business Instructional Facility accommodates state-of-the-art classrooms; career development and academic counseling centers; student program offices; a recruitment suite; 300-seat auditorium; and meeting and study space. The facility utilizes sustainable design elements, such as lighting and shading control systems, green roofs and gardens, and solar voltaic cells and is a LEED® NC Platinum certified building. The facility’s U-shaped structure surrounds a commons area and a spacious courtyard, providing space for students to study and interact with each other, as well as a location for events and corporate receptions. The exterior facade, made of brick and glass curtainwall, is accented with limestone and Indian chocolate slate, and an ascending zinc roof unifies the facility with the existing business campus. 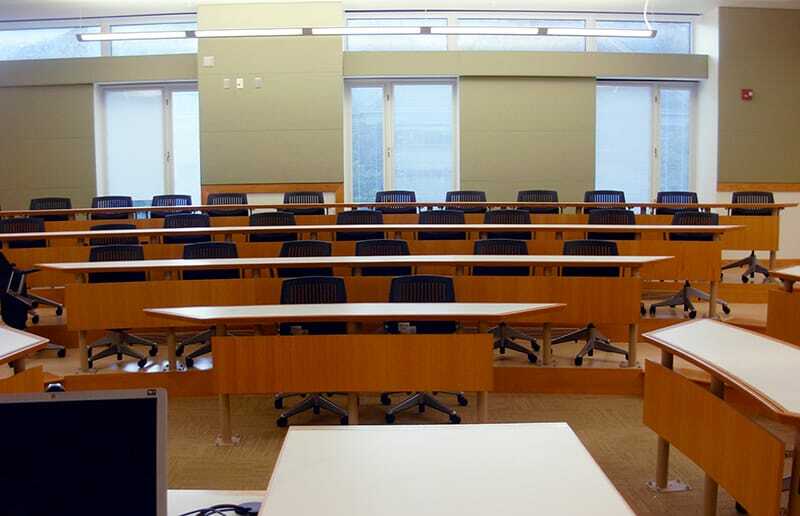 Public spaces are found primarily on the first floor and include the commons area, student lounges, study areas, corporate recruitment center, multi-purpose interview rooms, and the auditorium. Nearby reception areas encourage students and speakers to interact after an event. 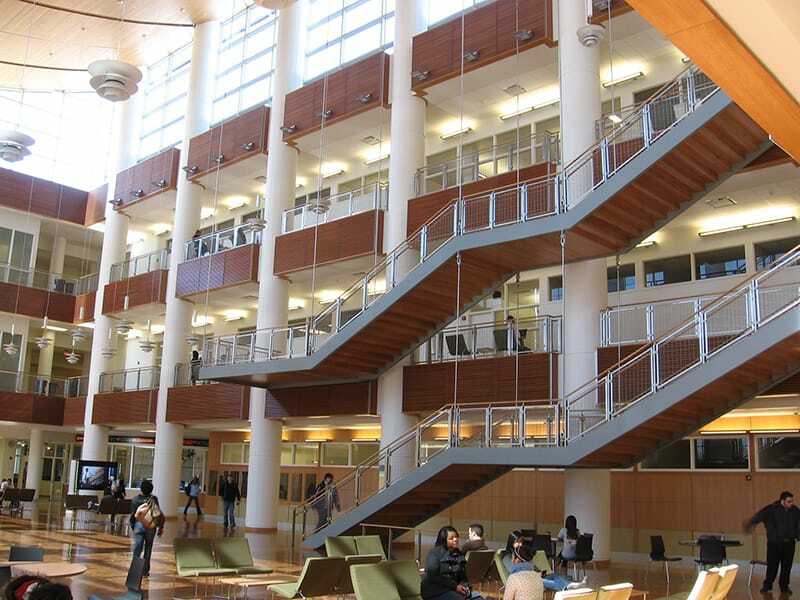 The first floor also houses the office of undergraduate affairs and business career services, accountancy student center, and market information laboratory. The laboratory allows students to participate in hands-on exercises that imitate a wide spectrum of real business situations. The second and third floors house state-of-the-art classrooms, both tiered and flat, that are equipped with modern instructional technology. The third floor contains the MBA program. The facility’s east wing also has a fourth floor that contains meeting spaces and faculty offices. The project achieved LEED Platinum status and is the first building on the University’s Urbana-Champaign campus to achieve LEED certification. Gilbane managed and tracked the project’s specification submittal requirements for products and materials called for to achieve LEED credits. Gilbane also tracked and managed the construction waste management plan and the construction indoor air quality plan during the construction phase to assure receipt of these credits.